Arma 2 oa server crash detection to auto restart? Hi, I was wondering if there was a batch file or way that would check to see if my arma 2 oa servers running every x minutes and if it detects it crashed it would kill the error window and then run my restart.bat file which would restart the server BEC and my whitelister. But also make it so it won't run/check if the restart.bat is currently running so it won't cause it to keep closing it while it's trying to start backup. If anybody has any ideas please share as something like this would probably help people so they don't have to worry about it staying shutdown if it crashes while there at work or sleeping etc. Use FireDaemon and run it as a service. Works very well. Tried using trial of firedameon but when I do it doesnt display stuff like host name load mission mods or anything what am i doing wrong? and i would love it if there was a bat file so I dont have to pay 50$ after 30dayz for something i barley know how to use. But if thats the only way for it to automaticlly restart on a crash then i guess ill pay for it,i was using the tutorial in the Server/Admin tools discussion sub forum (the one stickied) maybe its out of date or something? Ok and does this .bat file also force kill the has stopped working window? So the error window is WerFault.exe but it also still has the arma2oaserver process running is it possible to make it so it checks if the arma 2oaservers down and if there's a WerFault.exe running or should I just turn error reporting off and use it as is? 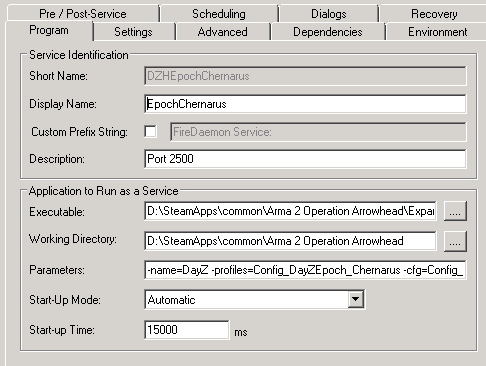 Is it possible to make it so that it would also restart it if arma2oaserver is un ping able ?